The last regular season Bassmaster Elite Series event in 2010 was scheduled for the Arkansas River in Oklahoma. Due to toad-straggling rains, the river became unsafe, causing the event to be moved to another location nearby. That new location happened to be Fort Gibson Lake, which happened to be Tommy Biffle’s home field. The late change in venue left the anglers with only one day of practice remaining. 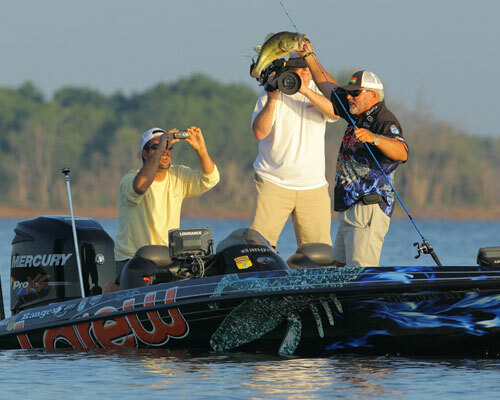 With 40-plus years of experience on Fort Gibson Lake, Biffle figured one more day probably wouldn’t make any difference. Plus, he didn’t want to reveal any of his money holes. On the practice day, stayed on home, mowed his lawn and probably ate lunch at Wendy’s. It’s easy enough to see that he had confidence in the areas he was going to fish. However, having confidence in just your fishing holes doesn’t always get you across the finish line first. You also have to have confidence in your chosen bait. He had that area covered too. All four days of the event, Biffle didn’t just toss a bait; he used bait system consisting of a hook-weight combo called the Larew Biffle HardHead and a soft plastic creature bait called the Biffle Bug. Though the Biffle Bug was launched in 2010, I felt it deserved to be recognized again. The Bug is now available in 10 new colors and in a smaller size. The original Bug is 4.25 inches long, while the new Bug Jr. is 3.5 inches long. Don’t worry, the largest HardHead with a 4/0 hook will still work with the smaller size. Okay, so the new colors and smaller size aren’t the only reasons the Biffle Bug made this list. The deciding factor for me was how good this bait really is. It has the ability to load your livewell with a limit of quality bass very quickly. And, it’s easy to rig and easy to throw. Technique Tip: Throw it out, let it sink to the bottom, then start a steady retrieve just fast enough to allow the bait to bump the bottom. The retrieve speed will be somewhere between working a Texas rig and reeling in a spinnerbait. Don’t work the rod tip or try to get fancy with it, just reel. When you feel a strike stop the retrieve, let the fish swim with the bait for a second or two, then let’em have it. By the way, Tommy Biffle led the Sooner Run event wire to wire, winning with a 4-day total weight of 73.11 pounds. For more of OutdoorChannel.com's coverage of new products from the 2011 ICAST sportfishing show, click here.